Howdy Y’all, welcome to Doc Collier Moonshine Distillery. Stop by and try Gatlinburg’s finest shine at stoplight #3 on the Parkway in downtown Gatlinburg. We are proud to offer our customers (with valid ID) the opportunity to sample any of Doc’s flavors including our one of a kind Moonshine Brandy! Along with tasting some of the finest moonshine in Tennessee, you can see some of the equipment that William “Doc” Collier and his family have used for generations to make their moonshine up in the mountains. Doc’s Shine Shop is setup just like an old-fashioned country Mercantile Store, like the one his daddy first sold ‘shine. Be sure to take some time to browse our gift shop for special things we’ve handpicked to give you a smile and help you remember your Gatlinburg moonshine experience. Want to purchase Doc Collier glassware or apparel? Click here. Just bought moon shine there on Saturday, we are so pleased with the product and staff!!! That is great to hear! Glad you enjoyed our product and the crew…. we have a good bunch working with us and (if we may say so) some of the best moonshiners around! We came down to Pigeon Forge to get married on Saturday April 26th. After the wedding we ventured into gatlinburg to look around and came across Doc’s. Man what a great experience. The shine was, we throught, the best off all the distillers in Gatlinburg and the people were the friendliest most down home folks we met. We got to hang out and share tales with the guys and learn a little history. It was exactly the experience you should have sippin shine. We will absolutely be back before we head home and its already a destination whenever we return. My sister and nephew brought me a bottle of the Apple Pie Moonshine back to Louisiana. WOW is this some good stuff. Smooth going down with a nice finish of apple and a slight hint of cinnamon. Can’t wait to find a local vendor and get another bottle! We are happy that you enjoyed our product! Unfortunately, if you want more of Doc’s products, you are going to have to visit the Smoky Mountains in Tennessee because our product is only available at our distillery. We will save a spot at the bar for you! Visited Doc Collier’s in Gatlinburg on June 25th. The staff was extremely nice and helpful. Loved the store. Just visited Doc Colliers. Very funny and informative staff. Did taste testing and lived the apple pie and blackberry. We will leave on Friday but will be making a trip there before we leave. Very home town feel. Felt welcomed like family not so commericilized. Thank you Buddy for making it a memorial time. Loved the moonshine, the staff, and the cool products in the store. Please open an online shop before the holidays! Jodi- We so wish that we had the legal ability to ship our products, but due to the high alcohol content of moonshine, carriers will not transport it! Please join us at the distillery the next time you are in Gatlinburg. Thank you so much for your kind feedback! We were in Gatlinburg to visit the Smokies for a couple of days, from NYC and wanted to hit up all the distilleries for free samples…Doc’s was the most unique, thorough and authentic. We met with Billy who gave us our samples. He was incredibly knowledgeable, informative and really gave us a real feel for Tennessee with his witty character given that he himself is a local. The overall team was enthusiastic about their products and quite entertaining. We bought the Original which was our favorite. The other flavors were delicious as well but we couldn’t carry all that liquor home by plane. Hoping Doc’s will continue to grow and succeed, though not at the expense of their product and authenticity of being a true local distillery. Yay for Doc Collier! We’ll be driving back at some point to fill on up on the good stuff. Josh waited on our group of 4. He was friendly and helpful. This distillery is one of the best in gatlinburg area. We will revisit next time we are there. The only problem is it is so good. We need to replace quickly. First trip to Gatlinburg and I absolutely had the best time ever! I visited all four distilleries and tried every product sample available. Doc Collier Moonshine was hands down the best!!!! The rum was also awesome! The staff were extremely friendly and answered every question I had! I strongly advise everyone to walk the extra couple of blocks to visit them! I will be making another 6 hour trip soon to buy as many bottles as I can carry! Tam – Thank you for the kind words! We hope to see you again real soon! LOVED YALLS SHINE! Is there any way to get some apparel? We just left Gatlinburg and I regret only getting a jar and not a shirt too. Online apparel store would be awesome! Thanks for the experience! Mickey – Your suggestions for an online apparel store has been passed along…fingers crossed for one in the future. Came there in July and loved the Apple pie. Is there anyway to buy it online ans have it shipped? Misty – Unfortunately, we are not able to sell and ship our products. We hope to you see again soon though! Chuck – Thank you for the kind words. We can’t wait for you to visit again!! Thanks Shonna! We hope to see you again soon! We came up to Gatlinburg 12-22-14 and visited Doc’s. I really enjoy moonshine epically the flavored varieties. I’ve tried all of them up and down the street and Doc’s is BY FAR the best!!!! My only complaint is that I bought the small bottles instead of the larger ones to bring home. My wife is not a moonshine drinker, but after she tasted the Peach she converted. Haha. I agree with all of the other posts on here when they talk about the staff and how friendly they were. You can tell that they truly enjoy working there. Thanks Doc, for making the best moonshine on the planet. Merry Christmas! Thanks Kyle. We sure are glad you liked the shine and us! Come back and visit again soon! My brother and I stopped and tried the blueberry brandy. It is amazingly good. So good we each purchased two bottles. I have to say that Doc Colliers is so good that I will no longer go to the other two establishments in town. I will be in Gatlinburg Tennessee fromFebruary the 13th to the 17th this will be one of my first stops I go to when when get there. Thanks Quentin! We will keep a place at the bar for you. Best shine on the strip. Making special trip from Indiana to pick up a case of blackberry in March. Thanks Dave. We will see you in March! My husband and I both came into your store, loved the moonshine sooooo much, next morning we came back and got more.. The staff was so awesome they told the history of the moonshine, and everyone had a bubbly personality. reason one to go back was the best tasting moonshine I have ever tasted, reason two is the staff… Going to make a five hour road trip back down there very soon..!! Chris and Tabby thank you for the kind words. We hope to see you both back here soon! Have to say compare to other places doc’s firecracker shine is a good blend and will be back to purchase more in a month when back in area from Illinois it’s worth the trip and Josh was a great host for us. I work for a distillery myself out of Yemassee, SC and I thoroughly enjoyed the tasting and the staff and was impressed when they’d heard of me! Look forward to visiting Gatlinburg and Doc Collier again! We were just in Gatlinburg for vacation last week. Never knew I liked moonshine until their sampling. Best shine down there! Great staff. Reasonably priced. Planning a trip back from IN just to get more! Sweet Tea, Peach, and blackberry are my favorites. Love that they uses real juices, tea, and cane sugar! Heidi – thank you for the kind words. Come back and visit soon! I am sitting here enjoying your lovely rum. The wife and I visited Doc Collier’s and thoroughly enjoyed the experience. We sampled nearly every flavor. The crew explained each of their products with knowledge and flair. We will be back as I don’t think 4 bottles is going to last long. Was there last weekend I am friends with some of the moon shiners but got to say u have the best tasting shine in the mts and great staff will return this weekend. We visited the store yesterday, Cam gave us the history of your shine and answered all the questions we had. He made it such a great visit we are going back today to buy more shine and apparel before we leave Gatlinburg. It was the best distillery we have ever visited. We were in on May 9th and had a very enjoyable time tasting the different Spirits! Anna was the Lady behind the bar who explained the differences in the moonshine. She also made tasting the Moonshine Brandy a fun and learning time. Thanks Anna and Doc Collier! 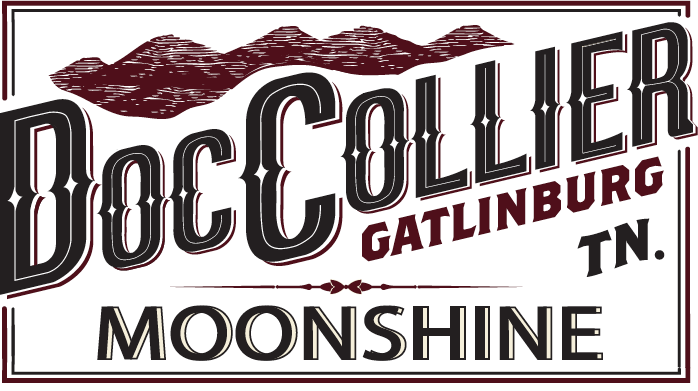 I believe Doc Colliers moonshine is the best in Gatlinburg. We will not go back to drinking the competition ever again. Thanks Bruce, we look forward to seeing you again! The Peach, Apple Pie & BlackBerry is the best moonshine I’ve ever had and I have tried a lot of moonshine. The experience we had in the distillery was a blast…you need to work a deal with some of the liquor stores (especially in South Carolina) to sale your shine. Thanks Scott. No distribution as of yet. Good thing you are close, you will just have to come back and see us! Came in to the store after an extremely long day with our friends kids at the aquarium…Josh completely turned the day upside down (for the better). He was super up-beat, knowledgeable, and helped us with tastings, premium tastings, and product! We are so happy we visited…thanks for the help Josh! Keep that hairdo rockin! We’ll be back! Thanks Rian, glad we could make your day better. Come back and see us soon! My husband an I were in town on Thursday, and got to enjoy a moonshine tasting. I had never had moonshine before, and found the staff to be helpful, friendly and fully knowledgeable on all of the products sold in your store. We also purchased a 4 pack of moonshine, and got to share with family and friends. We WILL BE RETURNING!!!! SO GOOD!!! We just visited your store yesterday. We each got a bottle of our favorite spirit. The staff was very polite and informative. Can’t wait to make the trip from Ohio just to get your shine. Keep up the good work. We walked in and were instantly greeted. Love the staff working there and received lots of information as to why Doc Collier is so different than others. Left with some Sweet Tea and Peach moonshine. I must say their candles are the best also. Thank you so much for the great experience! What can I mix with the blackberry or the buckeye moonshine? Was up at your shop on Christmas Eve. Love your apple pie moonshine mixed into hot cider with a big spoon of honey. Just the thing to quiet down your cough and let you sleep through the night. Your blackberry mixes well in some Asti or Champagne, just a little to elevate the flavor of your favorite bubbly. Too much and it goes wrong. The blackberry is also great poured onto vanilla ice cream with a little fresh blackberries sprinkled around it. Also good in blackberry cobbler and blackberry daiquiri’s. Is there any other place to purchase your products besides Gatlinburg, TN? I live in SW Florida, almost 800 miles and 14 hours away. Have your thought about doing a franchise store? My Fiance and I would love to run a business around your products. Do you a have a new flavor of the month? Every month? Is there a way to order your products online ? I did not see an option on the website. Hi Doc, are you shipping shine yet? Live in Ohio and wish I would have bought more. When will the Buckeye flavor be available again? We bought quite a few bottles when we were there a couple of years ago. How long do these keep? Some are opened and others still closed. Thank you. My family vacations to Sevierville every other year. This year was the first time we backtracked to the beginning of the Parkway to Doc’s. We have been kicking ourselves for not going sooner. Best fruit shine around! Using real fruit juice definitely makes the difference. Hopefully, when I retire down there, you’ll be looking for some help! I love the people, the mountains, the shine (of course! ), just everything about East Tennessee! Keep up the great work! Got a bottle of the Naner monshine from a family member that visited Gatlinburg. Man it is delish!! Tastes just like banana taffy, and who doesn’t love that stuff!!! My husband and I dropped in this week and absolutely loved your product! In my opinion it’s much better then what’s down the road and we will for sure be back! My wife and I came to Gatlinburg for vacation and we came to Doc Colliers and Trey was absolutely the friendliest and funniest guy we had met in town. He is very helpful and went above and beyond what he was required to do. My wife and I had a great experience there. Trey definitely highlighted our experience there!!! You guys picked the right guy for the job! I don’t understand why this product can’t be widely distributed when other high alcohol content liquor is. It’s so good I would love be to be to buy it in Oregon. I can get Old Smokey shipped out, but not this. I heard great things so we stopped in. Erica took great care of us. I’m kicking myself for not buying Smoky Mountain Sunrise. My favorite of all the moonshines I tried at any of the distilleries. Make sure you stop in! Anthony was awesome. Flavors are amazing and the atmosphere in the bar. Pricing is very reasonable. Recommended and I will return. 5 out of 5 stars. This was a great experience! Never been to Gatlinburg before & stopping here was a great way to end my trip! I believe Anthony was the guy that did the moonshine tasting (not sure if that was his name because i had a little too much moonshine, hahah) he was awesome!